I wasn't able to watch Rafa's matches live, but his early results were encouraging: defeating his opponent in the second round, Steve Johnson, in straight sets, 6-4, 6-3, as well as his next opponent, a more experienced clay courter, Simone Bolelli, 6-2, 6-2. This "moment of magic" lob in Rafa's third-round match against Bolelli was the kind of shot one can make only if one has confidence. 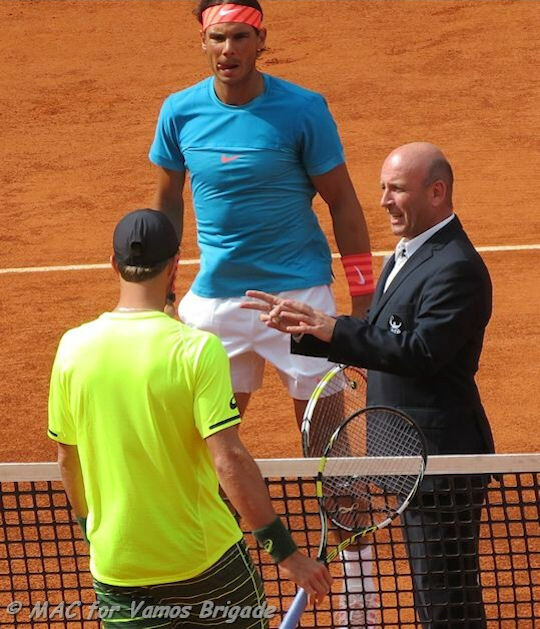 So, not only was its appearance breathtaking, it indicated that Rafa was finding some of the "good feelings" he had been looking - and working so hard - for. Rafa's quarterfinal opponent, Grigor Dimitrov, was several levels up from Rafa's first two opponents. There were multiple breaks of serve in both sets, but Rafa apparently kept his focus and toughed out the victory in straight sets, 6-3, 6-4. 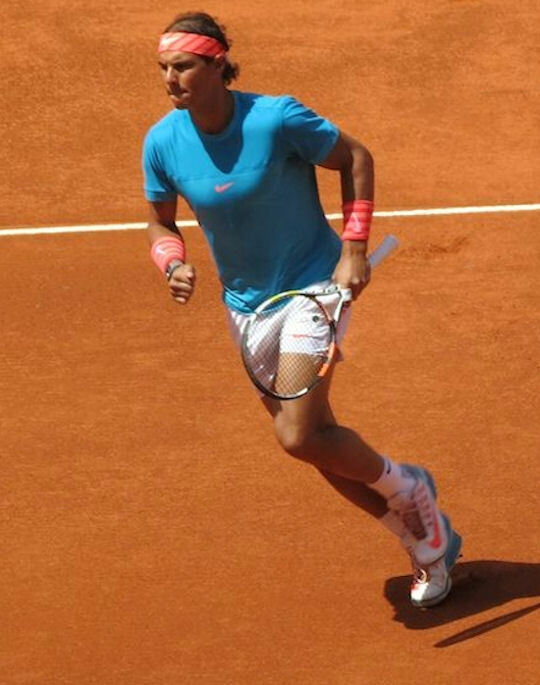 In the semifinal, Rafa faced Tomas Berdych, the sixth seed, who had ended a 17-match losing streak to Rafa at this year's Australian Open. There was little to separate them in the first set. Rafa managed his service games impeccably but couldn't capitalize on the two break opportunities he manufactured. 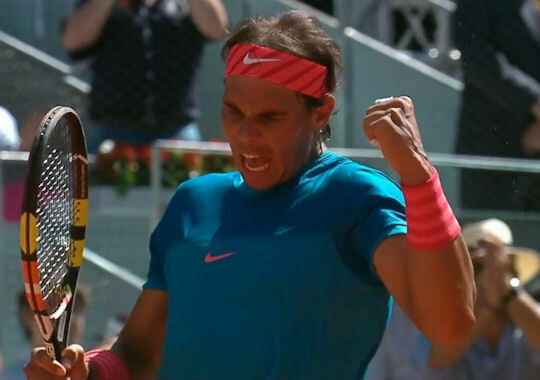 There were flashes of Rafa's trademark forehands, like in this "Hot Shot." Rafa played a strong and smart tiebreak and then seemed to "find" himself in the second set. Winners flowed from his forehand and unforced errors all but disappeared. 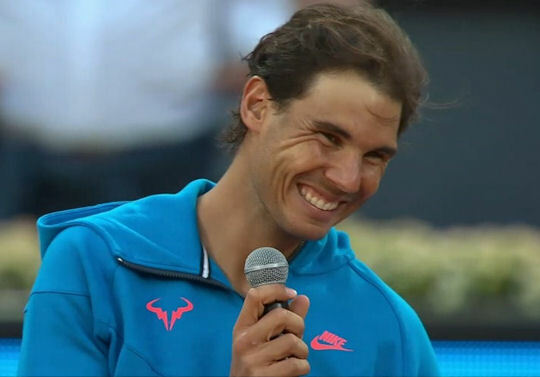 He won his semifinal in straight sets, 7-6(3), 6-1, and thrilled us all. "For the past couple of days I have been playing better and better every day. That's always very good news. I am in the final. I am happy for that. I am enjoying a lot the fact that I am playing in front of an unbelievable crowd. For me, that's the best crowd in the world without any doubt. So that gives me a lot of really positive energy. "Today I played again at a very good level. . . . This week has been fantastic for me. This is a very important result, and that's confidence, that's positive energy. That's calm, too. Let's try to continue tomorrow and try to continue with that good feeling next week. I worked a lot to have that feeling, and today I had that feeling that I've been trying to find for a while." 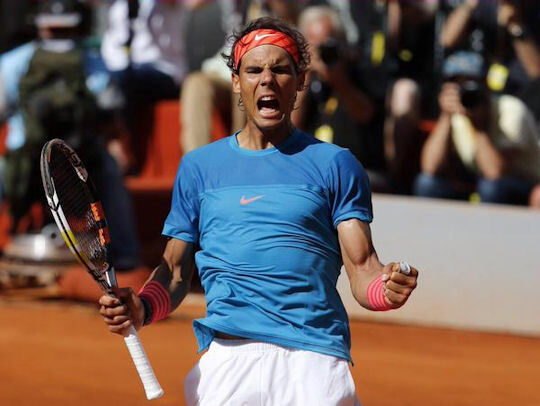 but he lost to Andy Murray for the first time on clay, 3-6, 2-6. 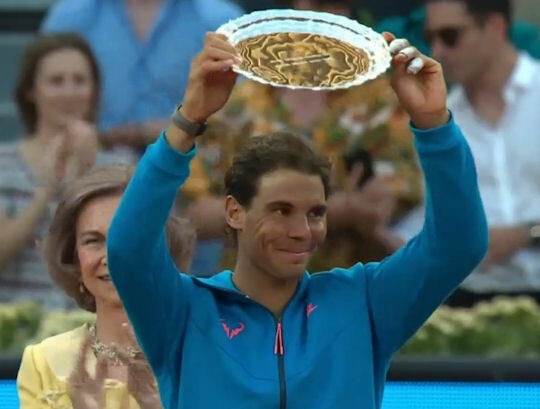 He raised his runner's up award with a smile, as one would expect from him. "I've played a couple good matches [this week], especially yesterday's match. It's one of the best matches I have played in a long time. So I cannot leave Madrid not happy. I have [to] leave happy and just delete what happened today. I will just stay with the good things that happened this week, and there are a lot of them, more good than bad. I will try to recover in Rome the feelings. I think I've made a step forward and I'm playing better. My game is better."